Kayalvizhi sits in the verandah of her house, eagerly awaiting the arrival of her grandchildren. Every evening at 7pm, not too long after the sun has set, the power goes out in her house. Earlier, Kayalvizhi would go about making dinner by the dim light of a kerosene lamp and wait for the power to be back. But ever since she bought a solar-powered lantern, she actually looks forward to the daily power-cuts. The reason? The bright light of the lantern brings her entire family together each evening. Her sons and daughters-in-law who live nearby come over for a chat. Her grandchildren come over to finish their homework under the light of the lantern, armed with their books and tales from their day at school. For the two hours that the power goes out each evening, Kayalvizhi’s household is abuzz with conversation. A solar lantern that she purchased on a loan of Rs 1500 has made a bigger difference to her life than she imagined. It has cut down her expenses on kerosene. The light is brighter and she no longer has to deal with the fumes of kerosene that hurt her eyes. Her sons sometimes even use the lantern to recharge their mobile phones. But more than anything else, for Kayalvizhi and her husband, the lantern’s biggest impact is immeasurable –precious hours with their children and grandchildren every day. 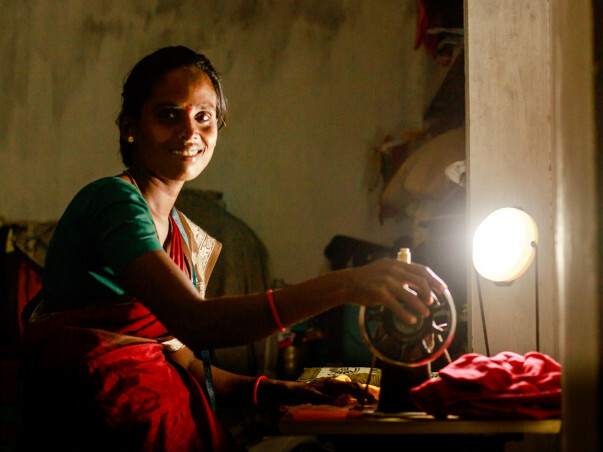 Many women like Kayalvizhi have made the decision to take a loan to buy a solar lantern since they see the value in the product, but are unable to afford the cost upfront. Some others have invested in energy-efficient cook-stoves. The stoves cost Rs 2500-2700, and use lesser firewood than traditional stoves. The emission of smoke is reduced to a large extent because the fuel is burnt more efficiently. This reduced exposure to harmful smoke translates to lesser breathing troubles and fewer instances of lung diseases. These cookstoves and lanterns do not cost too much, but they are making a significant difference to women in rural Tamil Nadu.